Winter Skin builds your tan with each application to create your perfect bronze glow. Applies just like a moisturiser to nourish skin and build a stunning tan. 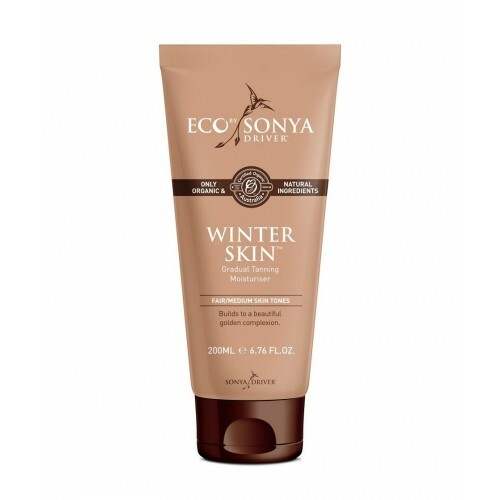 Blend of aloe vera, grape seed extract and rose geranium to replenish dry skin. Cacao fruit powder builds upon your natural complexion for the most beautiful, believable honey glow. Aloe Barbadensis (Aloe Vera) Leaf Juice*, Coco-­‐caprylate**, Dihydroxyacetone**, Glycerin*, Glyceryl Stearate**, Stearic Acid**, Potassium Cetyl Phosphate**, Cetyl Alcohol**, Xanthan Gum**, Lecithin*, Tocopherol**, Chamomilla Recutita (Chamomile) Flower Extract*, Pelargonium Graveolens (Rose Geranium) Oil*, Leuconostoc/Radish Root Ferment Filtrate**, Sambucus Nigra Fruit Extract**, Theobroma Cacao (Cacao) Fruit Powder**, Vitis Vinifera (Grape) Skin Extract**, Alcohol** Citronellol** Geraniol** Linalool** Citral** Limonene**.